If you work on SEO for your own website or for others, you’ll notice that there are tasks which come with the job. In fact, on the more technical side, checking redirects, titles and trackers are frequent activities. On the marketing side, finding keywords, checking whether or not emails were opened, and discovering email addresses in order to perform a sweet outreach are some of the other super common tasks you’ll have to perform. But what if I could help you speed up these dull processes? What if I was able to provide you some advice and refer awesome and free Chrome extensions that’ll make it easier for you to explore SEO to the max? These tools are the cream of the crop. I use these useful Chrome Extensions with all with my clients at Spark Foundry. But before I get to officially name these SEO extensions, there’s something you should know. These tools for SEO aren’t magical. They will only provide amazing clues and help you complete tasks much faster, helping you optimize your time like an SEO professional should. They won’t turn you into an SEO master, though. They’ll just help you out! My hope for the readers of this free SEO tool bonanza? That knowing these useful SEO tools is gonna improve your whole SEO process! Let’s see if I can get you to be more productive! Ready to be wowed by this phenomenal list of free SEO tools? Then check the best SEO tools for marketing pros and some of the coolest Chrome extensions you’ll need to get! I promise you won’t need to start learning how to make a Chrome Extension since these features for SEO are gonna rock your world! Let’s find the best SEO tool, shall we? Time to find the best On-Page SEO tool for you! Ready for some small SEO tools that will help you big time? I promise these are all of the very best FREE SEO tools for you to check and improve your skills! Here’s the list of the very best SEO Chrome Extensions! Ready for one of the best free SEO tools alive today? Want an SEO tool that effectively helps you find out about the specific technologies a website is using? Want to be able to get to know which CMS the website uses? Feel like you have to understand the analytics, the type of advertising networks the website plays with, the sort of web server, and much more? 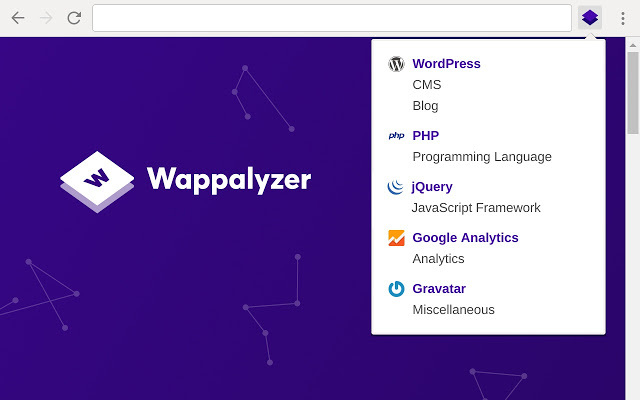 Then Wappalyzer is key to your SEO experience and a wicked Google SEO analysis tool you need to check! Normally, you’d need to know the website’s owner. You’d have to run into him on some shady street and ask away. This useful SEO tool is here for you. Get to know the exoskeleton of a website, what makes it tick and what secrets lie beneath the technologically crafted surface. This SEO master tool is remarkably important in your SEO research process. This great platform for SEO enthusiasts is quite similar to Wappalyzer. I consider it a basic SEO tool that everyone should explore. 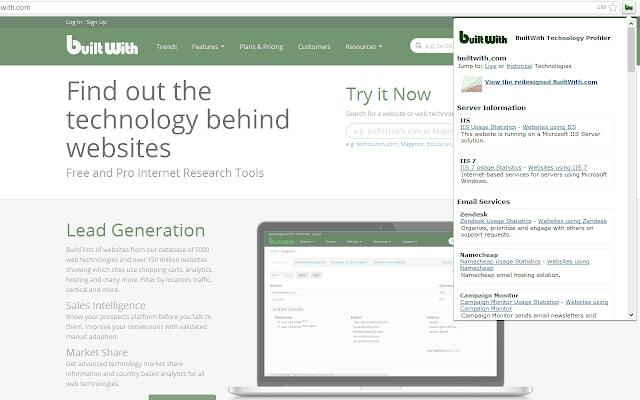 Just like the previous tool, BuiltWith gives you details of how a website is built, providing even more info, including which JS libraries, trackers, APIs, alternative mobile versions, which server is hosting a website and much more. 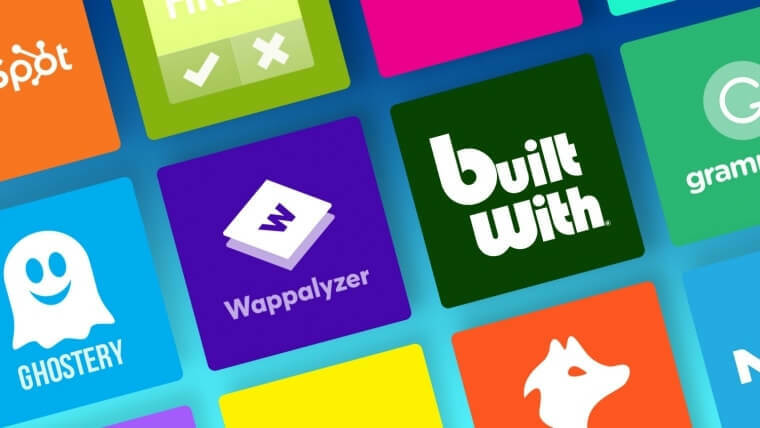 It will definitely provide more details than Wappalyzer. Even so, the interface can be a bit messier. This means that BuiltWith is probably a better option in case you happen to be a developer, since it definitely needs its users to have a coding background. Is this one of the best Extensions for Chrome or what? This is not an SEO tool but it can save you a whole lotta time, in case you’re a guy who takes screenshots every single day. I personally need to screenshot SERPs a lot. I had no idea there was a simple way to take a clear shot of the whole screen, including the part I normally would have to scroll to get to see. It doesn’t work on all pages. Even so, you can use it to photograph not only Google’s SERP but most of the other search engine tools around. Loved this Chrome Extension screenshot tool? Move on to another must have Chrome Extensions, then! There’s a crime out there. It’s on the rise but nobody wants to talk about it. Haphazard outreach emails filled with spelling mistakes! Is there a way to fix this plague? Don’t wanna start off with the wrong foot when it comes to the outreach stage of your SEO efforts? Boy is this the tool for you. Grammarly is a super awesome tool that anyone writing in English should get. 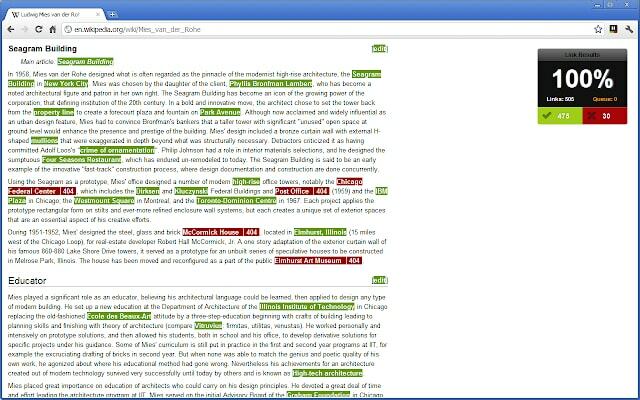 This is a very good grammar and spelling tool which is able to catch a whole lotta mistakes. Indeed, it catches more than the usual checkers from Microsoft or Google Drive. 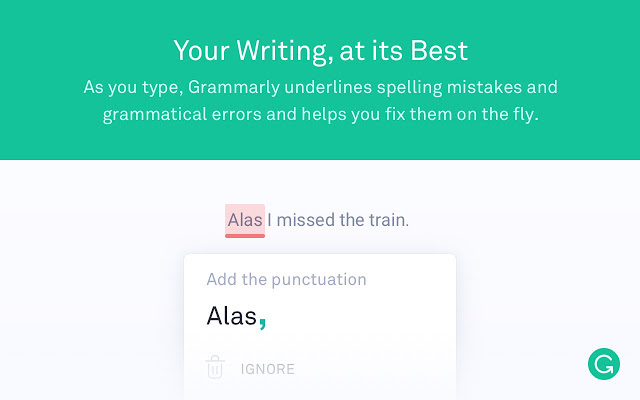 Grammarly will actually provide explanations for you to be able to understand what you wrote wrong and become a better copywriter. It’s not a miracle worker! You shouldn’t trust it blindly, or try to get by without ever reading a book, writing a gibberish-filled version of English and hoping this tool can save you when the time comes. Even so, this will surely save you from some shamefully embarrassing moments. Grammarly also has a paid version. The one they provide for free will do the trick! 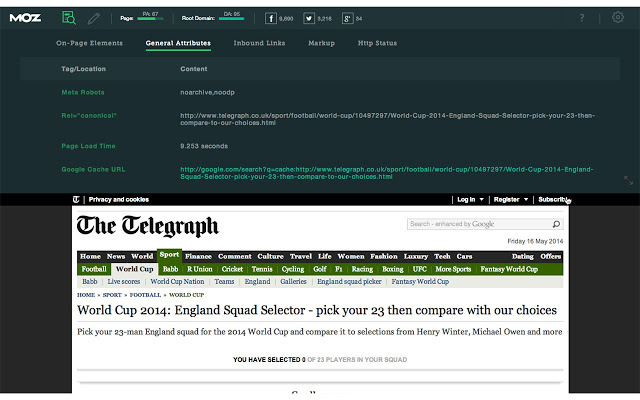 Now that’s one of the best Google Chrome extensions for SEO players! Google SEO tools that do wonders? Temporary redirects (302) are some of the most common mistakes SEO masters find on their daily activities. They also find that some websites keep forgetting the redirects between the www, the non-www redirects, and the trailing slash redirects, making the same page available on many URLs. Is there a way to avoid this chaotic mess? Am I ready to recommend another one of my awesome extensions for Chrome? Redirect Path is your friend! This extension will track every single page as soon as you open it and tell you what type of response code the browser received. If anything else but a standard 200 response code is found, you don’t even need to click on the extension to see the result. 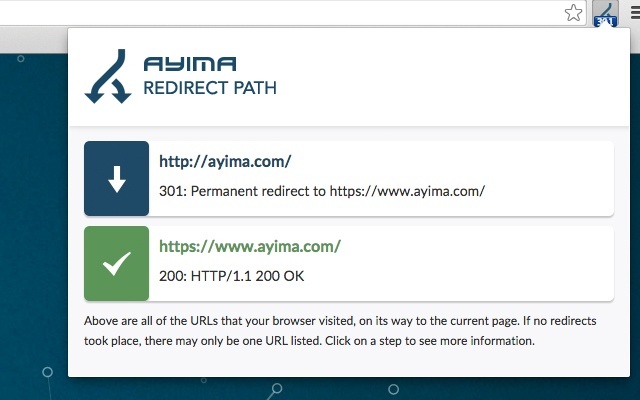 Redirect Path tracks all the steps, and is also quite helpful when it comes to finding pages with several redirects. Another one of those awesome Chrome Store extensions you need to explore! Feel a conspiracy theory kicking in and need one of the top SEO spy tools in the business? Wonder how many different ways there are to spy and track you? Think you’re being tracked as you visit a specific web page? This tool will allow you to find out what kind of trackers are onto you. This tool for SEO is more than helpful. Because having too many trackers messing up your game can truly be damaging. In fact, it can actually slow down your page’s loading speed. Use this tool to find out whether or not there are any unnecessary trackers corrupting your chances for SEO success. It’s common to forget an old tracking pixel on a website, as it doesn’t seem to cause any harm. But what if nothing relevant is being tracked? Why should users have to load resources and make their whole experience much slower and boring? 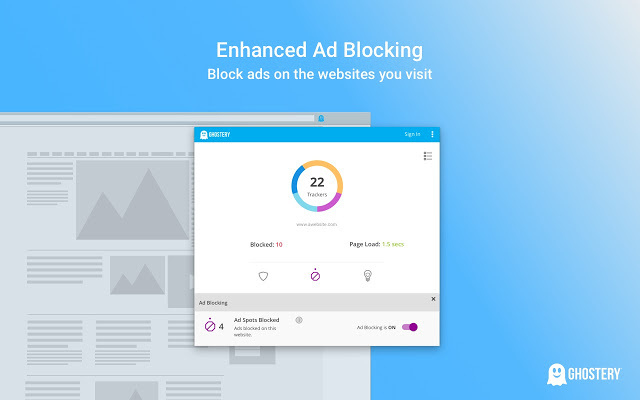 Speed up your life with Ghostery! 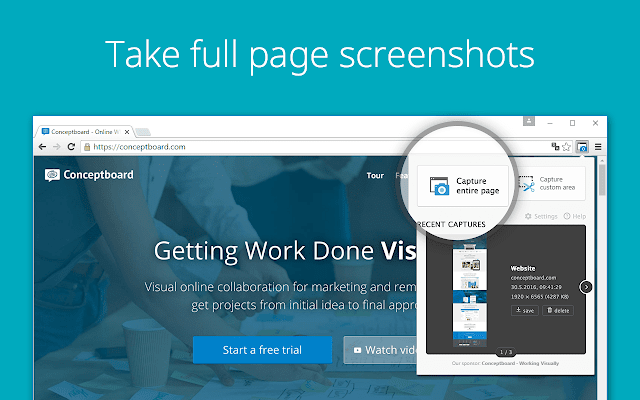 It’s one of the top Chrome Extensions for you to explore! As an SEO expert, you need to contact people all the time. How many minutes and hours of your day are spent as you try to actually find the contact info you’re looking for? A whole lot, I imagine. 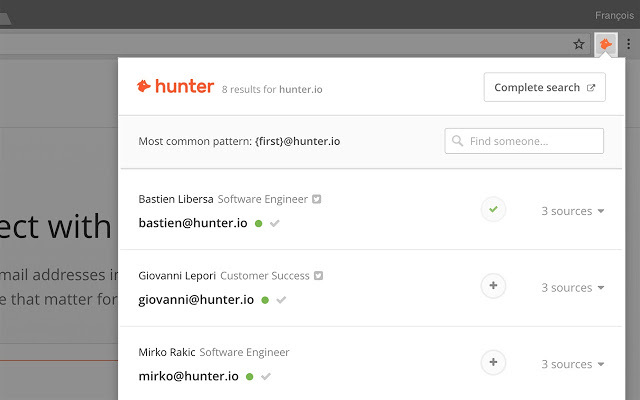 Hunter has a smart system which finds the most frequent pattern for a domain (e.g. first.lastname@company.com ), scans the website for emails mentioned on any page, and gives you a good guess of the email you need. If you outreach writers constantly, this Chrome extension is a real time saver. This truly is one of the best Moz SEO tools around and one of those free online SEO analysis tools everyone should dive into! Regardless of whether or not you trust the domain and page metrics given by SEO tools such as Open Site Explorer, you should definitely use MozBar. To take a look at the page code without opening a confusing page of HTML code. It’s an SEO analysis tool that changes everything! The MozBar will extract the title, description, canonical, cache, http status, structured data and highlight the types of links present on a page (follow, no-follow, internal, external). Awesome SEO bar for you to use, right? You know I only provide the Google Chrome extension you need to succeed! 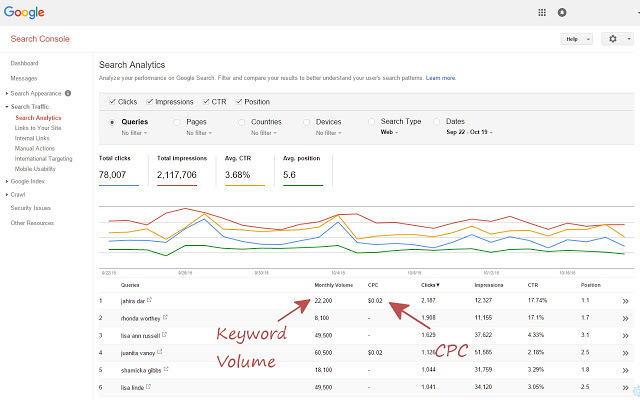 Wanna check the search volume for a specific keyword directly on the SERPs? 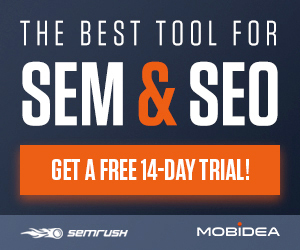 Want an SEO keyword tool that rocks? This SEO keyword research tool shows the data for the query searched as well as the “people also ask for” suggestions. Unfortunately, you can only find data for keywords written in English. You can also use this SEO keyword tool online to check the search volume for some markets such as the US, UK, and Australia. 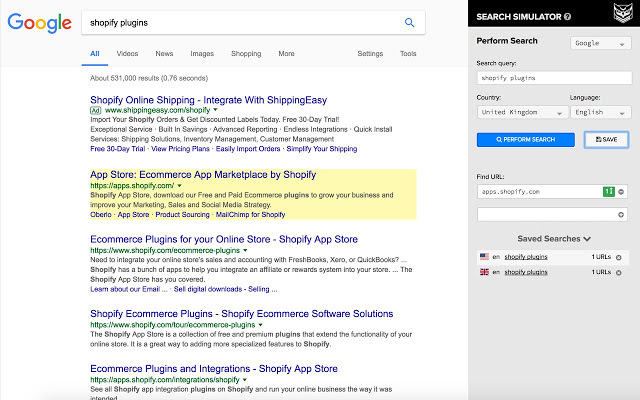 Besides the SERPs, Keywords Everywhere also presents the data directly in tools such as Amazon, eBay, Answer The Public, Majestic (Anchor Text Report), YouTube and 12 other services. Love this SEO keywords tool as much as I do? One of the best SEO software tools in the biz? 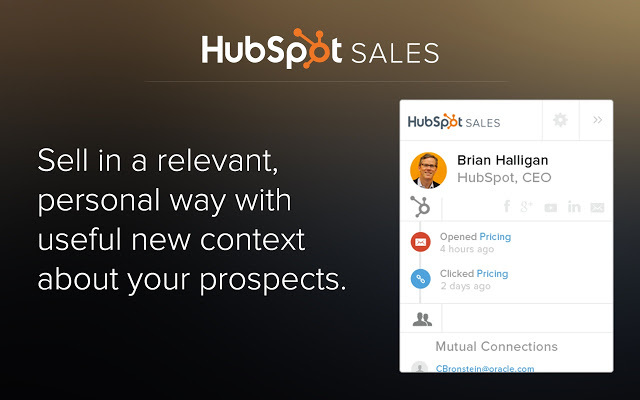 One of those awesome HubSpot SEO tools that keeps on giving? This tool supports sales with many features. The one I find most useful as an SEO? You need to register once. Then, every email sent via Gmail or Outlook can be tracked. It’s really useful, since it allows you to know whether or not someone is opening your emails many times, which can be a signal that they’re interested in whatever you’ve offered. This tool only works on desktop. You’ll also have some trouble in case the email is sent or forwarded to several people, as the tracking doesn’t know who opened it. This amazing SEO tool gives you the time and location. Even though it can be helpful, it’s not the perfect tool for SEO. An SEO audit tool that helps you every single day? One of those perfect SEO monitoring tools which never fail to amaze? Check My Links is here! Hunting for some broken links? Check all the links on a page for broken and redirects in one single click! This can be useful for you to find opportunities or to create a presentation for a client. Why is this free SEO audit tool useful in that regard? Because it allows you to create a visual representation of a coding problem, for instance. Is this one of the best marketing SEO tools or what? Link building is one of the most important tasks for an SEO. And sending emails is a critical part to get that done. So, how to manage this huge task getting most results while investing least time? I recommend you use SalesHandy. 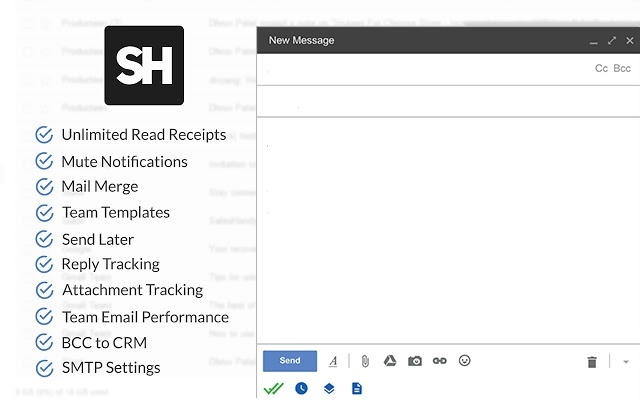 It lets you track email engagement data the exact number of times your emails were opened, link clicks, location, and even gives you details of activities on any documents that you have attached to it. It helps you know if your back-link prospect is engaging with your message or not and optimize your outreach accordingly. On top of that, it enables you to send personalized email merge campaigns with automated follow-ups saving you lots of time and increasing the response rate of your campaigns. Moreover, SalesHandy uses drip-method to send email merge campaigns adhering to Gmail’s daily sending limit, making sure you get higher email deliverability. It’s a great Chrome extension that helps you get more done using emails! This extension brings the data from the Mangools SEO suite any time you need it when browsing the internet. Without using any tool and without leaving the current tab, you’ll get the most important SEO metrics such as Domain Authority, Page Authority, Citation Flow and Trust Flow altogether with popularity metrics including the Alexa Rank, number of referring IPs and Facebook shares. 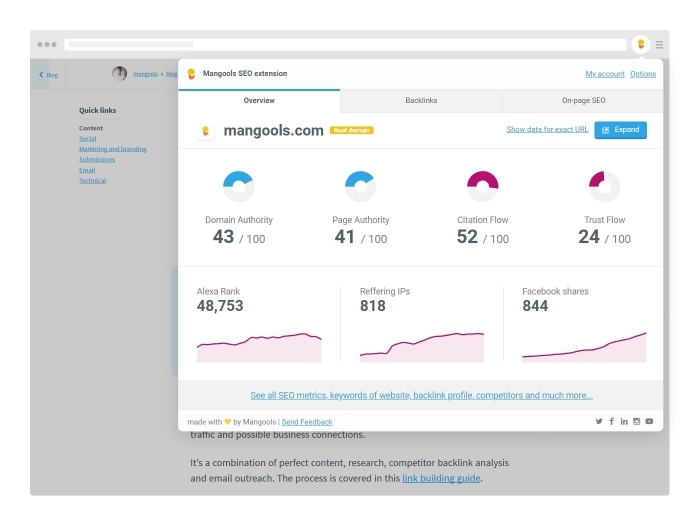 What’s more, you’ll get the list of backlinks with options for in-depth analysis in the Mangools tools in one click. The Mangools SEO extension provides an on-page analysis to spot any optimization errors in meta tags and headings. It includes the SERP preview tool, keyword density checker, word counter and page speed analysis tool. You’ll also find any broken outbound links and their anchor texts. One thing I really like about the extension is that it provides context menu integrations and advanced features available directly in the SERP. Related: Take advantage of our exclusive KWFinder discount. Tired of having to use Incognito mode, proxy or VPN to check your unbiased rankings? Nightwatch SEO Search Simulator let you simulate search engine queries from any location on Google. This is the easiest way for you to check and track your website or your competitor’s rankings. It’s free, easy to use and can save you tons of time. It’s a great extension that simplifies work for any marketer and SEO professional who wants to use an intuitive solution for rank tracking to check positions of the chosen websites in the SERP. Loved these SEO optimization tools and Chrome Extensions? Wanna start developing Chrome Extensions to help other SEO marketers? Which SEO extensions do you use and why do you use them? There are some White Hat SEO tools which aren’t necessarily made for a certain purpose, but you should make sure to maximize them, using them for your specific SEO efforts!